Much to my dismay, what once was a beautiful ornamental is no more. Every spring I’d look forward to seeing the pink blossoms displayed by our small ornamental crab apple. Slowly, branches seemed to die off as once green leaves turned orange and fell off. Over the past two years something finally took its toll this spring and I was determined to find out what it was. My largest concern was not so much for the ornamental tree but for the two newly planted apple trees approximately 15 feet away. What I found on the tree were empty cocoon-like scales near almost all of the smaller pencil-sized branches. A couple of them did pop and secrete a juicy, almost sticky substance, but that alone didn’t point to much. The only thing I could surmise is whatever this was, it was a sap sucker. With few answers, I finally decided to rid myself of the ailing tree and treat the surrounding area with insecticide. I trimmed off all branches and immediately bagged them for trash. The remaining trunk was then extracted and set to go out for the garbage. After the tree removal I did spy a few of these scales on another nearby tree. This time, nearly all of the scales were plump and juicy. Knowing I wanted to secure the future of my edibles producers I consulted with a friend and scoured the internet. The final conclusion was found the moment my eyes fell upon an image of a Brown Scale Insect. Bingo! 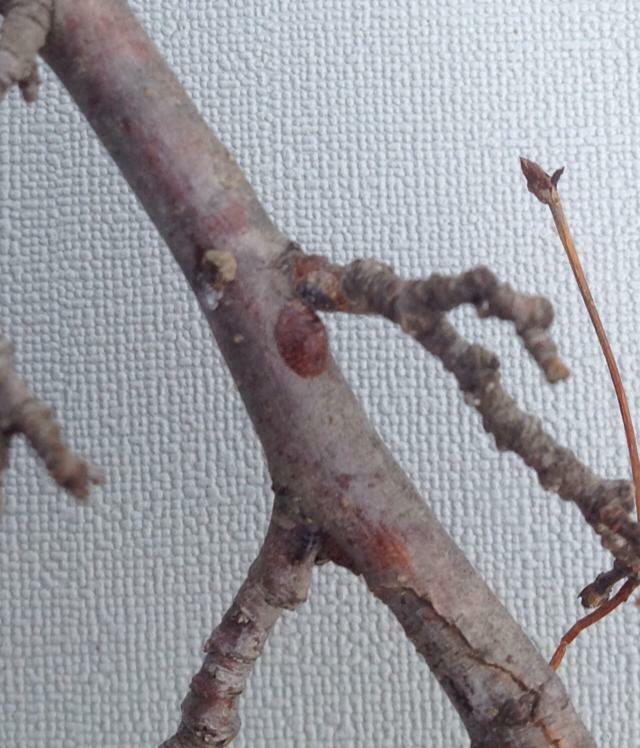 It was noted that Scale Insects are very difficult to get rid of. They can cause major damage to smaller, weak trees and typically are more pronounced on fruit bearing trees. Not good. These insects most usually occur in the presence of ants as the scale insect secrets a ‘honeydew’ substance the ants are attracted to. Scale insects are impervious to many insecticides because of their shell and to control them, they must be terminated during the crawler phase of their life cycle. I found a great article dealing with this particular type of pest published by the Texas Agricultural Extension Service. Below is the link found via The Urban Rancher. So the next step in this process? Treat, observe, and re-treat the infected plants. I’m hoping to save my apple trees from possible devastation from this pest. Perhaps I’ll have to invest in some lady bugs to assist me in this battle. I’m sure they’d love to live it up in my apple trees!